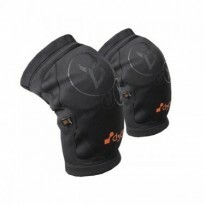 The Demon Soft Cap Pro X D3O knee pads. Introducing the next generation of versatile protective gear from Demon. The new Soft Cap Pro X D3O knee pads are the most versatile pads available. Constructed from flexible lycra and neoprene with the awesome impact absorbtion technology of D3O. These pads also have strands of beaded silicone to keep them in place during heavy exercise and sweating. Ulta-lightweight, breathable and incredibly comfortable these pads can be worn in a wide range of sports, snowboarding, skateboarding, kayaking, mountain biking, sailing, BMX and any sport in between where your knees take a battering.